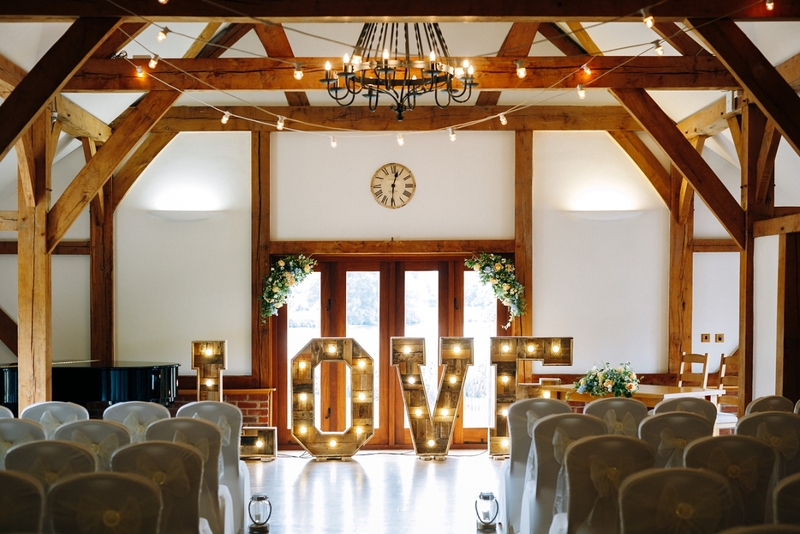 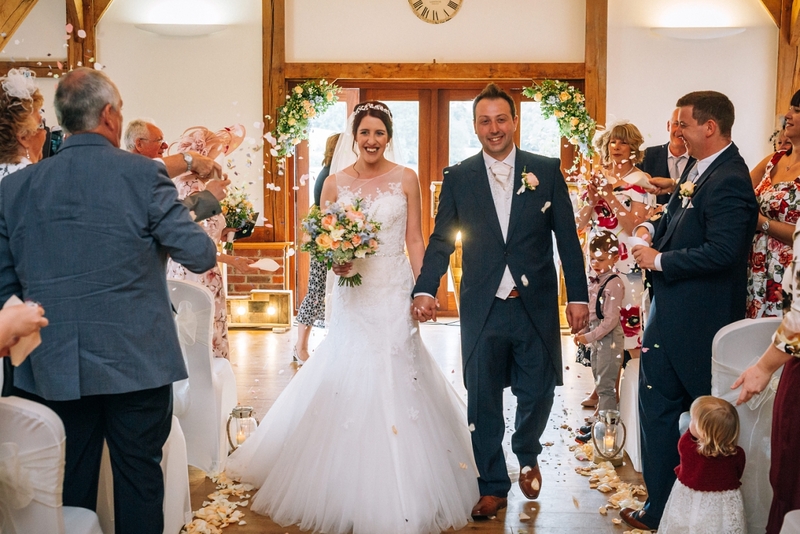 I bloomin’ love Sandhole Oak Barn wedding photography – and Jen & Baz’s super summery, glittery wedding day definitely didn’t disappoint! 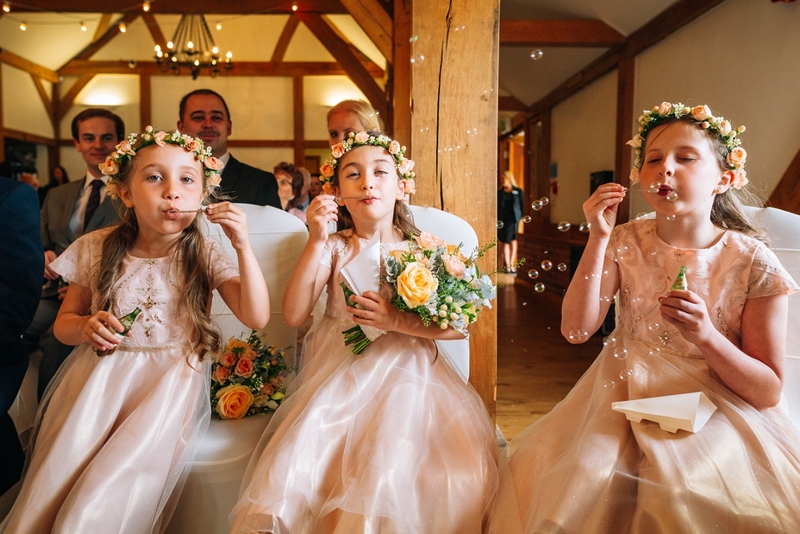 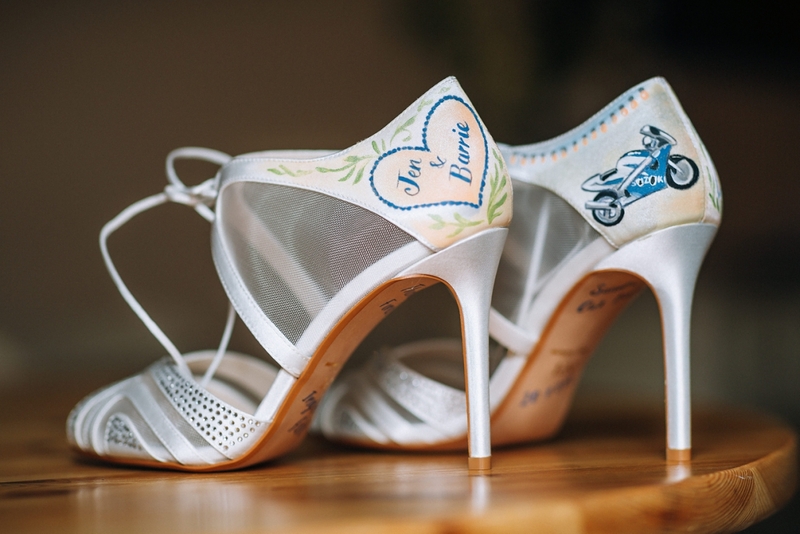 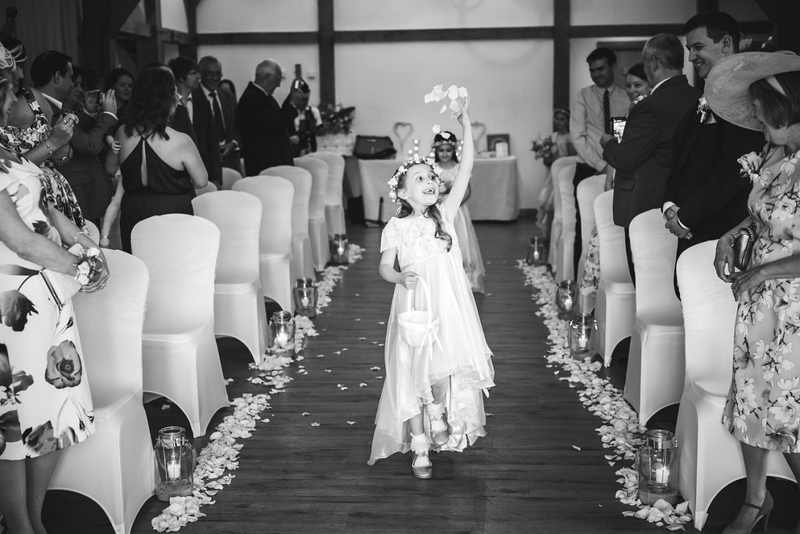 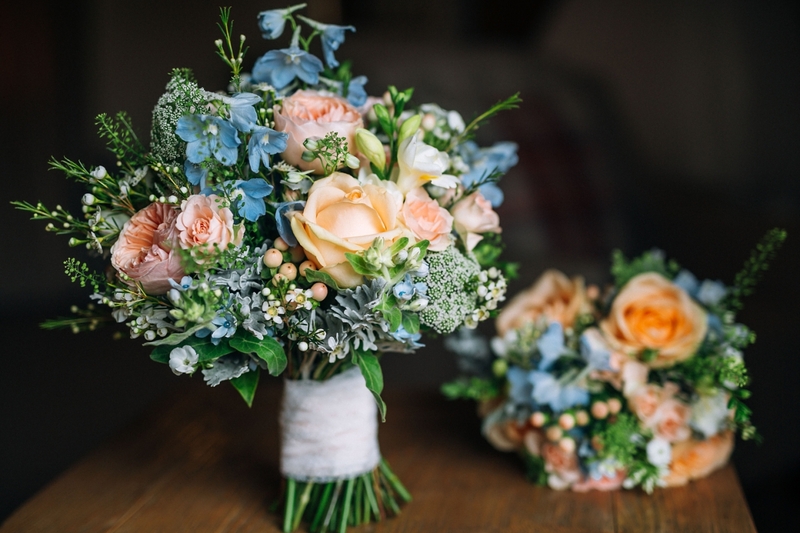 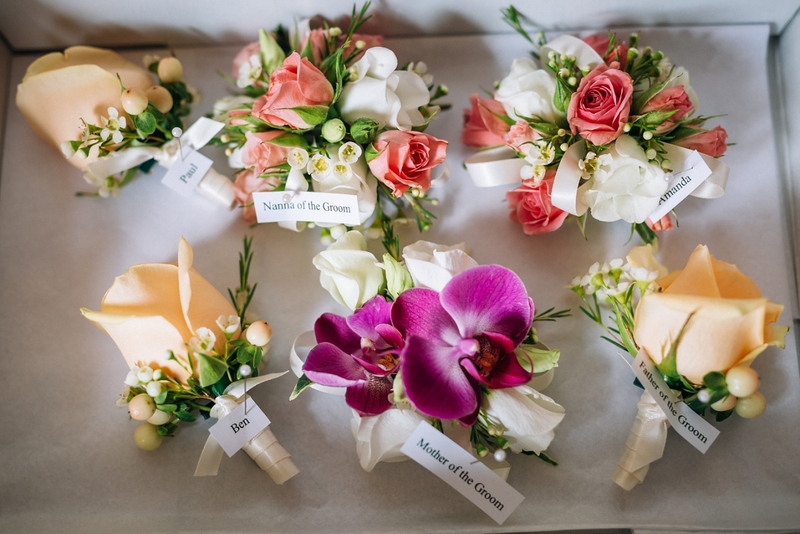 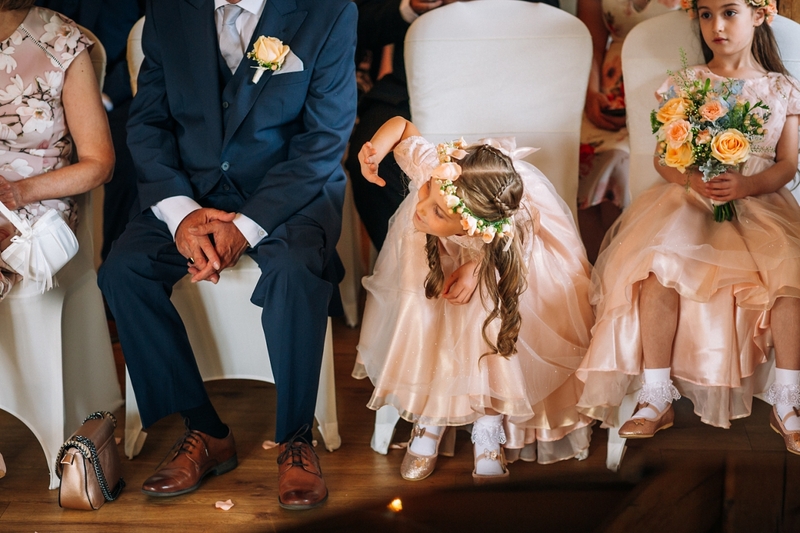 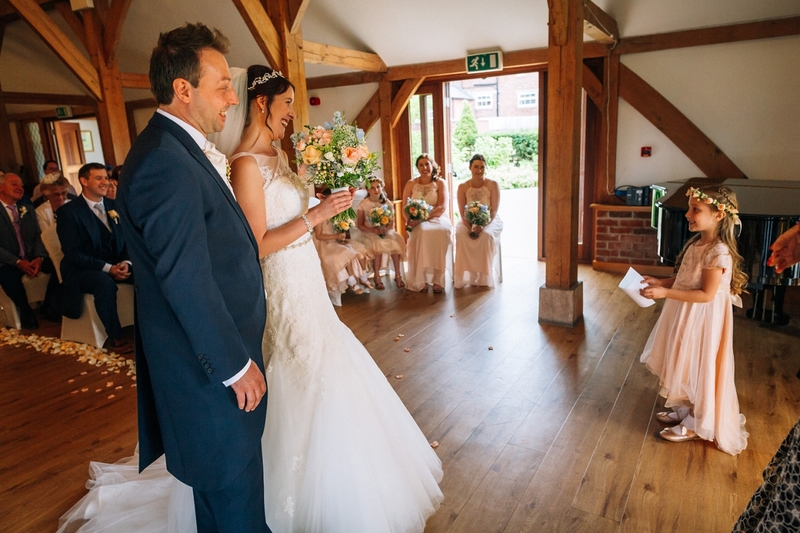 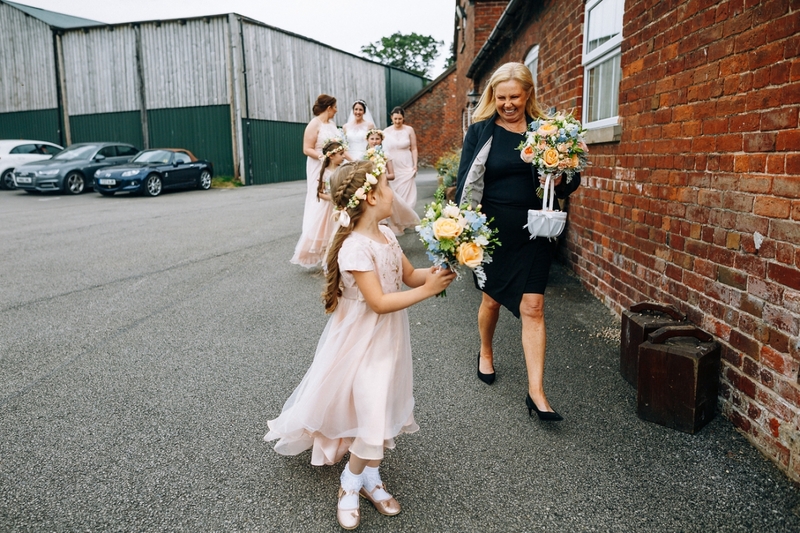 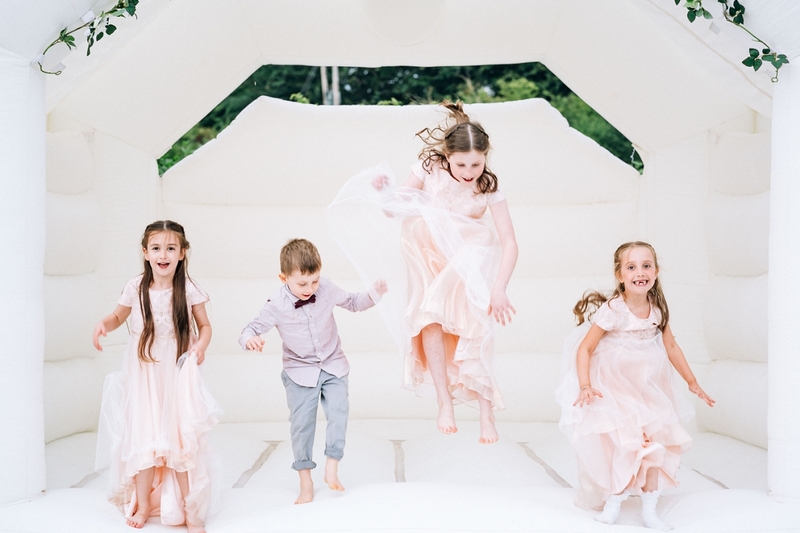 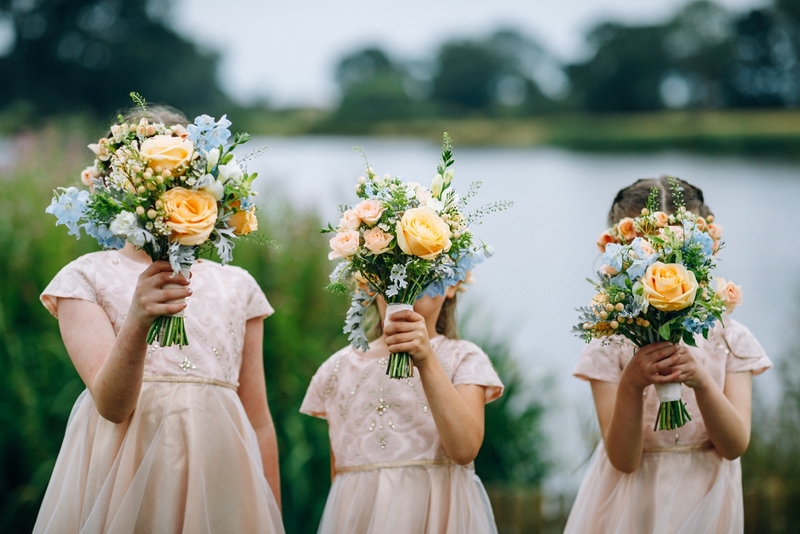 The gorgeous flowers, the incredibly cute flower girls, Jen’s ultimately bespoke shoes, dapper Baz and his groomsmen, oak beams and plenty of sunshine (after a forecast of rain all day! 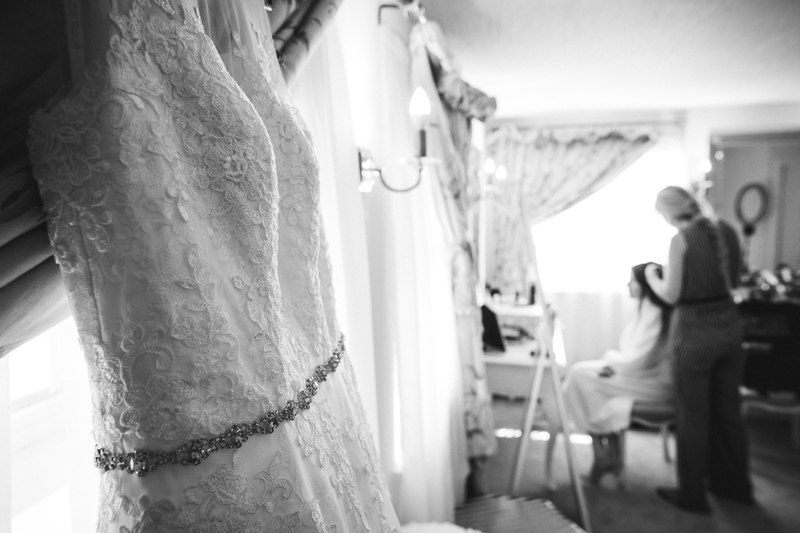 )….sooo many good memories from this one! 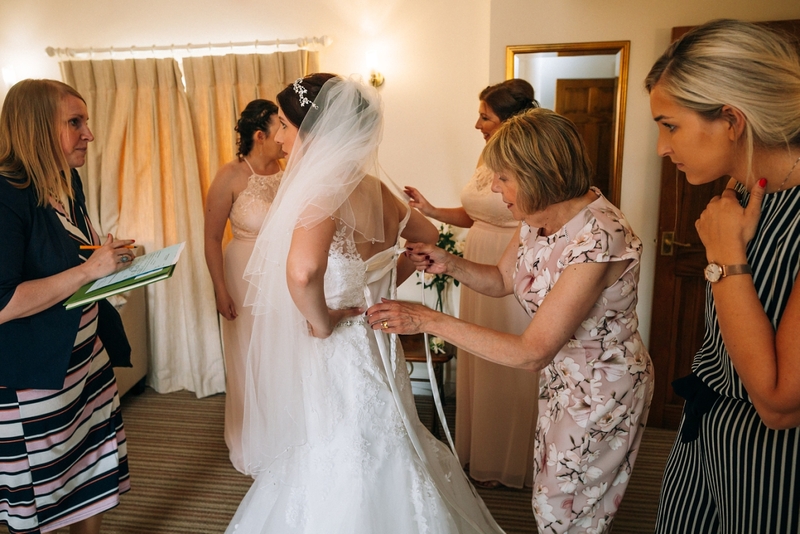 As I mentioned, we had expected rain all day but we seemed to miss the worst of it, and with both bride and groom getting ready at the venue the preparations were definitely not spoilt by any weather. 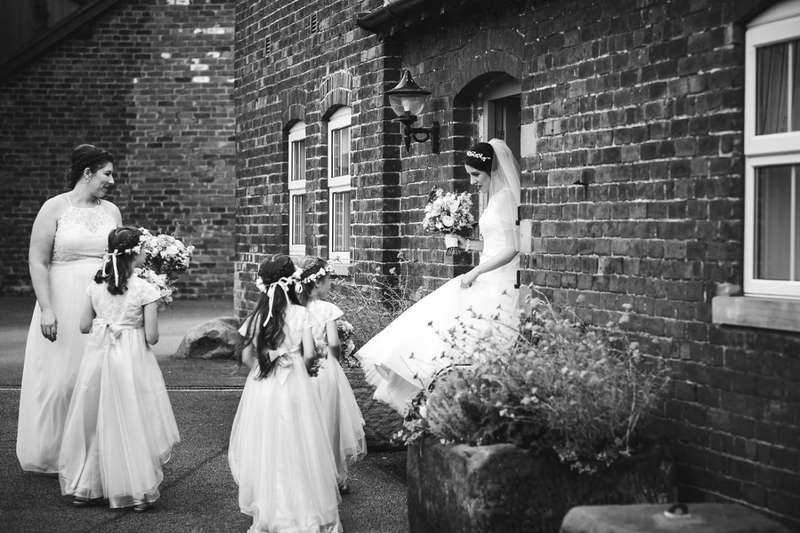 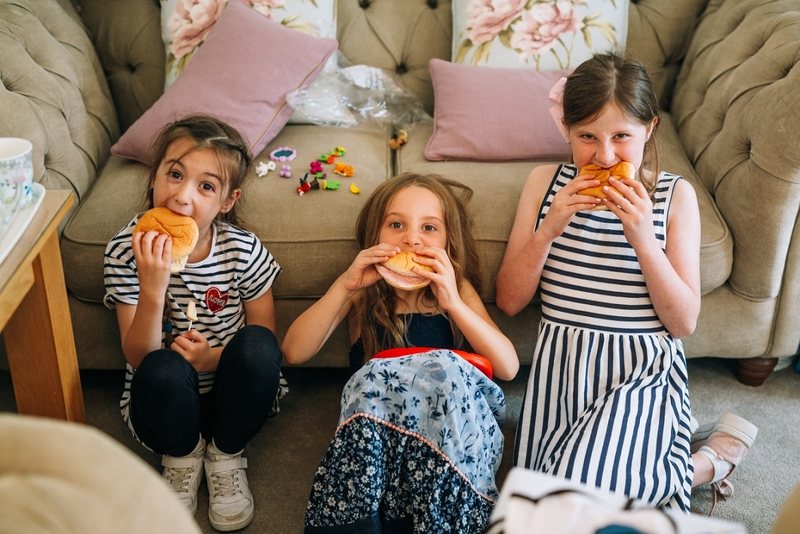 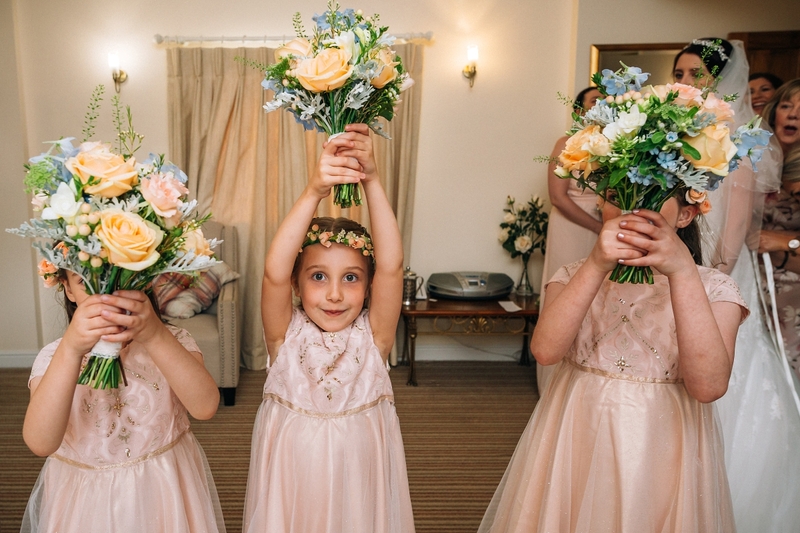 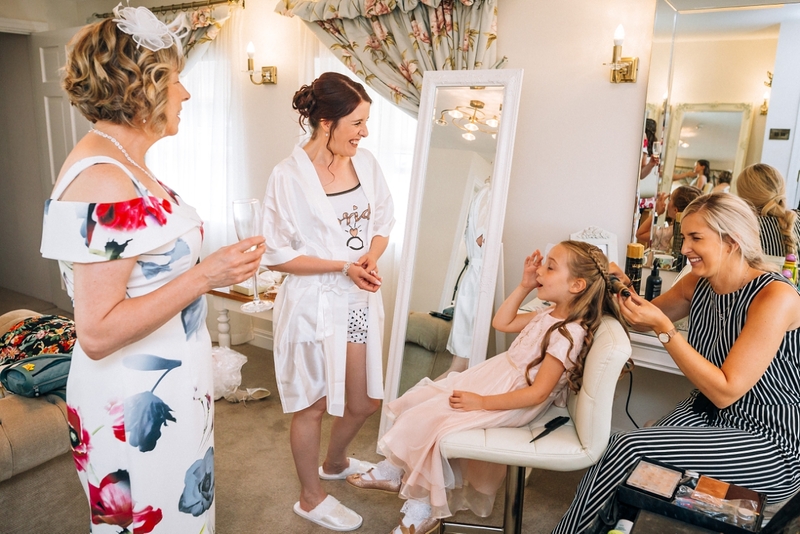 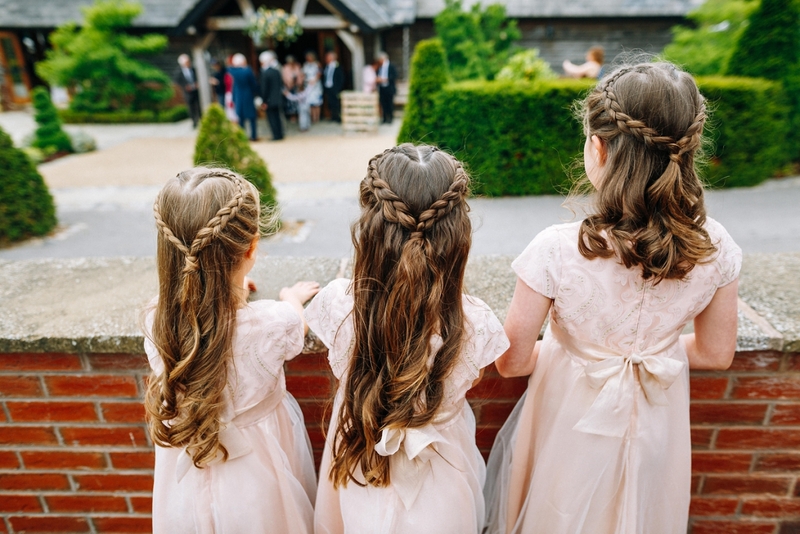 I love the pictures of the super cute flower girls peeping over the wall, while Jen was busy getting ready, and as Baz was busy greeting all their guests to the beautiful wedding venue. 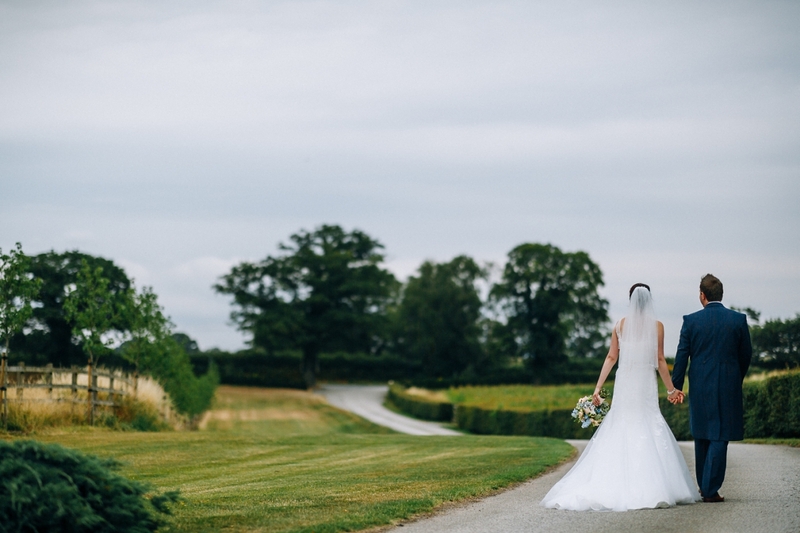 With the guests in place, and the very short walk from her room to the barn it was time for the wedding to start. 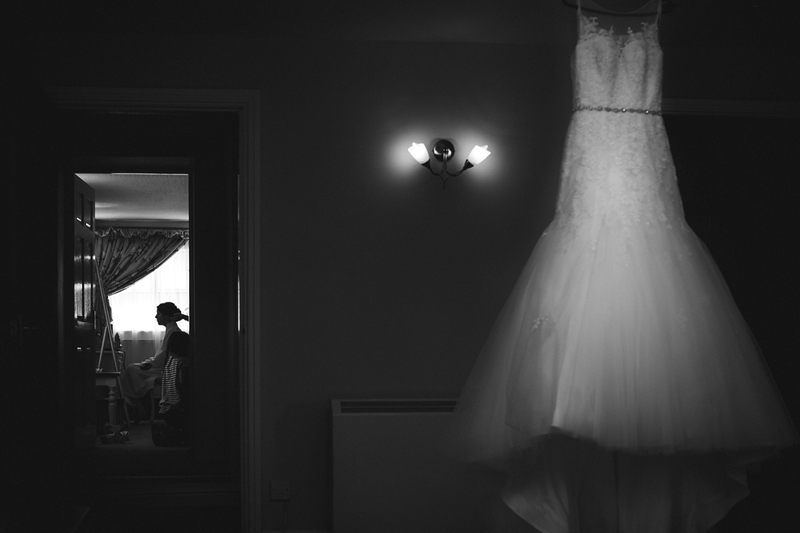 Having been to plenty of weddings beforehand (!) 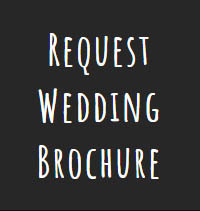 it never ceases to amaze me how unique each service is. 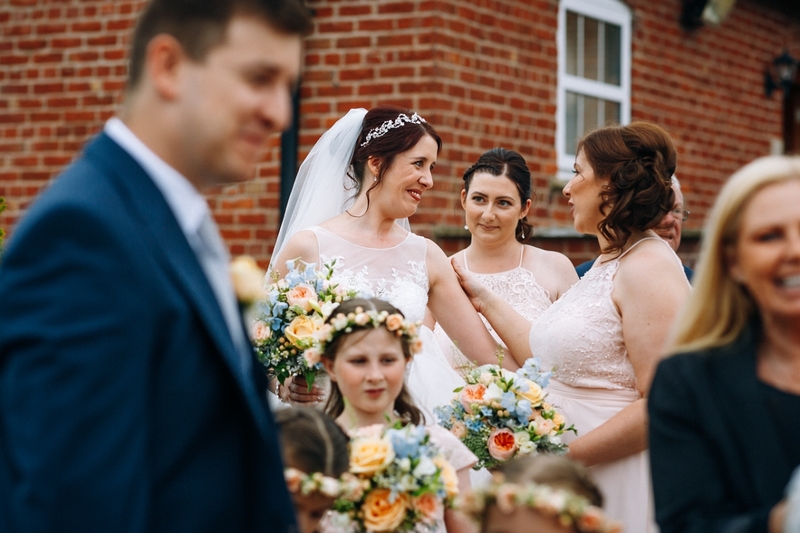 Yes, they all follow a very similar flow but each couple’s personalities are always injected in there somehow, and for Jen & Baz (literally two of the nicest, most thoughtful people you could wish to meet!) 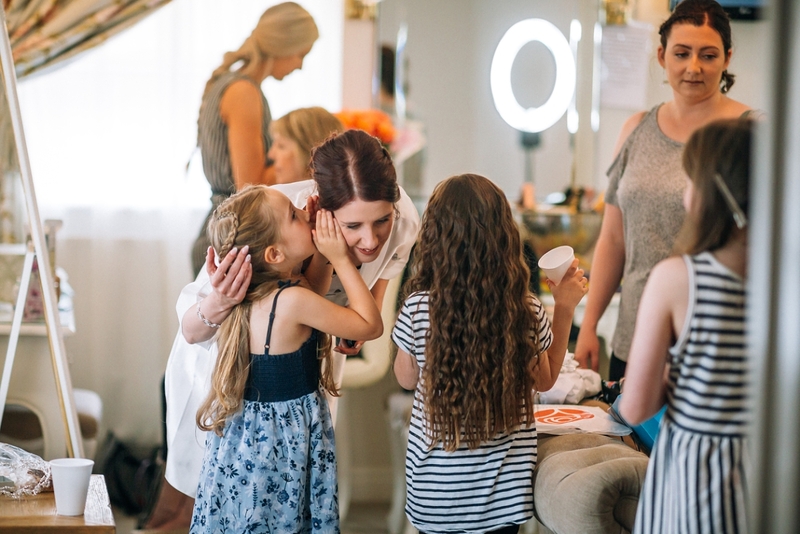 this was certainly true. 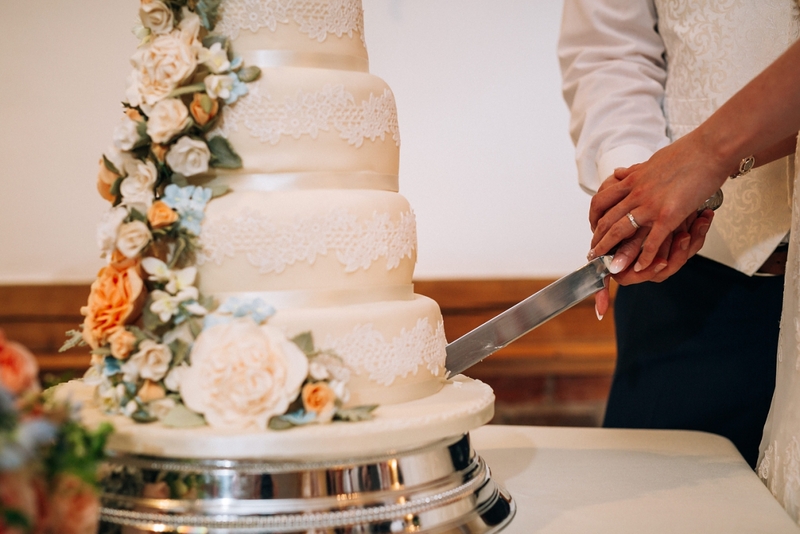 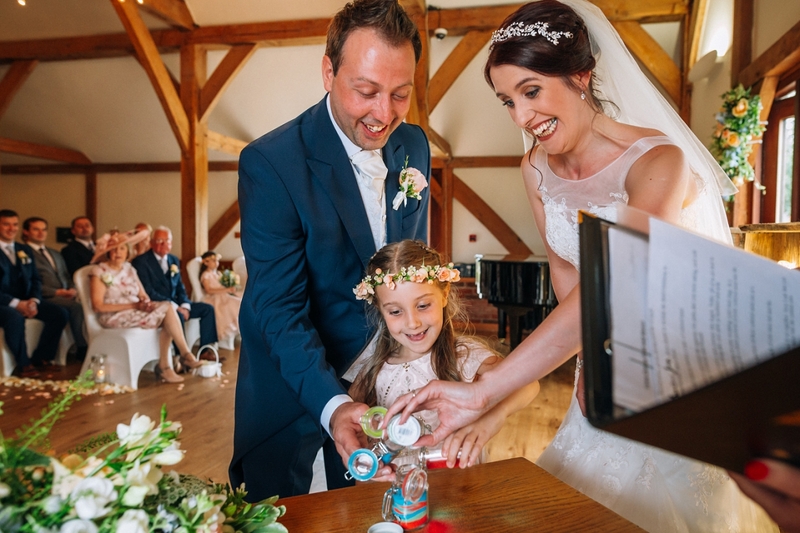 Their vows were made whole-heartedly and to include their daughter as they did was beautiful – they each had a pot of different coloured sand which they poured into one single jar – really symbolic and something I hadn’t ever seen before! 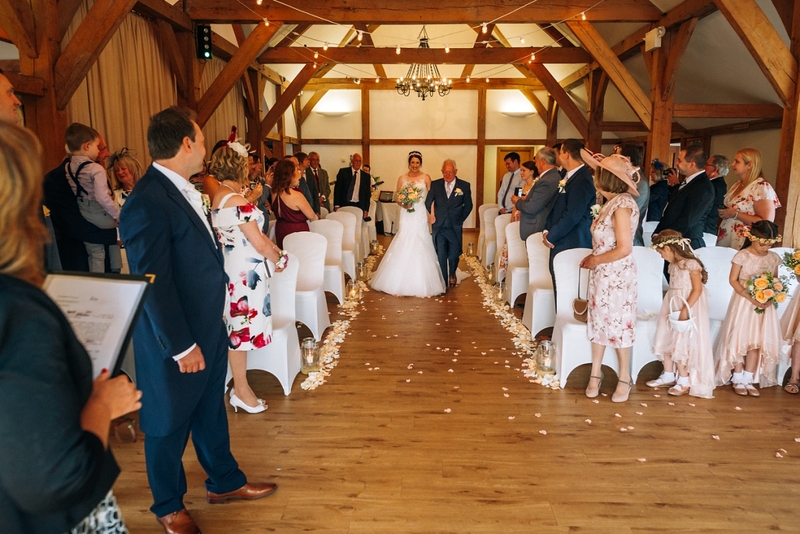 we had planned to do the confetti shot inside, so as the newlyweds walked down the aisle they were showered with the most gorgeous rose petals, a pretty romantic way to be introduced as Mr & Mrs! 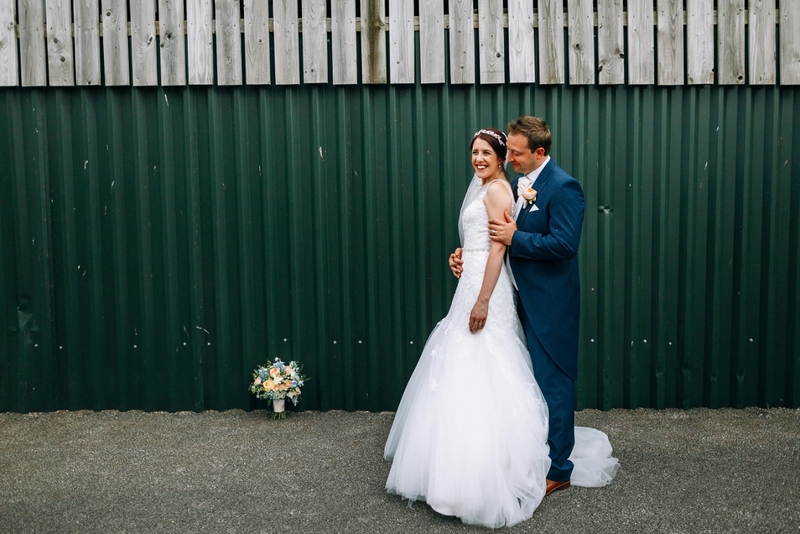 Jen & Baz and their guests were then able to use the courtyard outside the barn for the drinks reception which meant there was plenty of opportunity for making the most of the stunning grounds the venue offers. 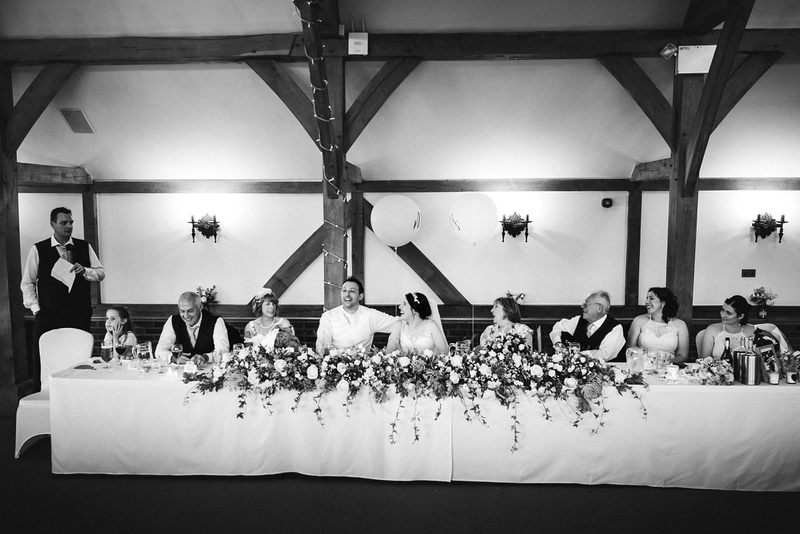 With group shots done Jen & Baz got to have a few moments together away from their guests. 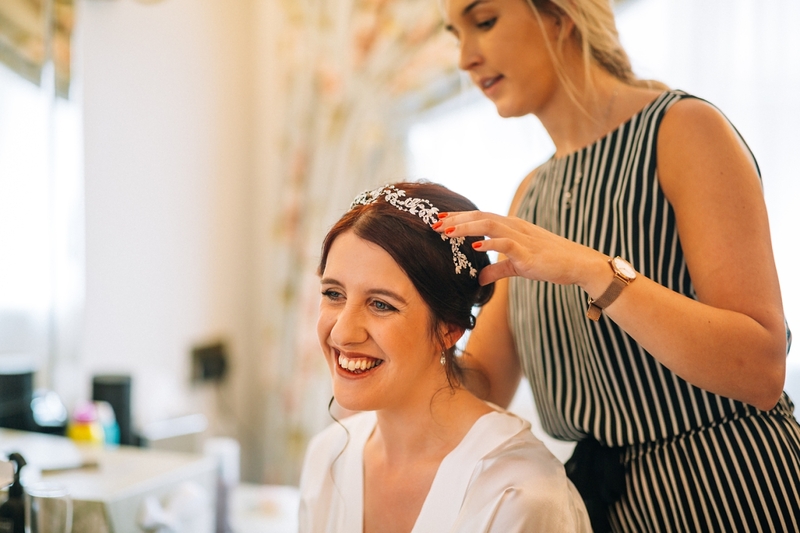 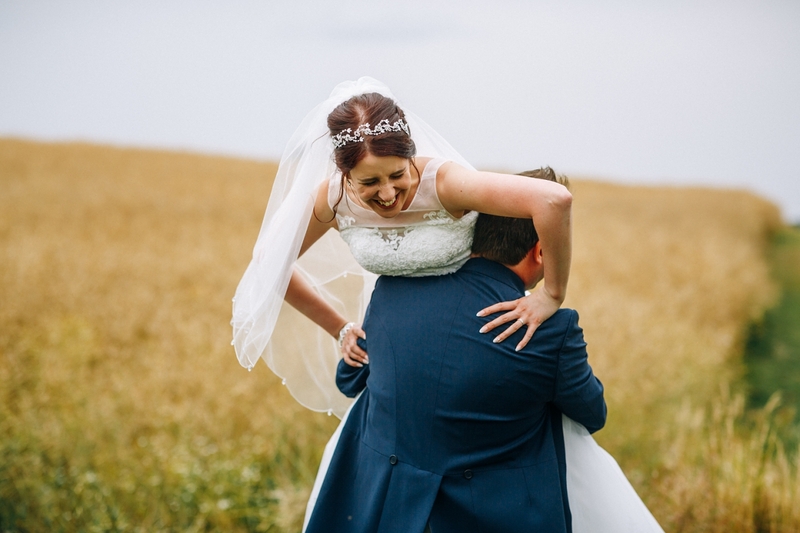 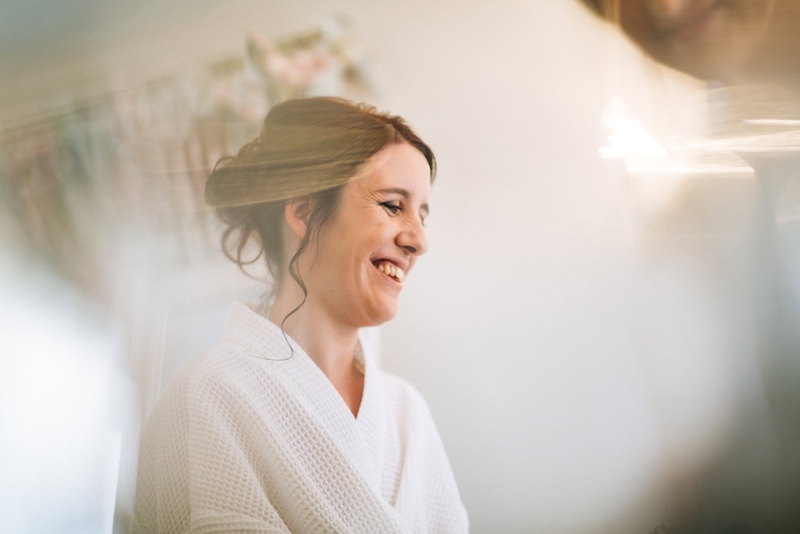 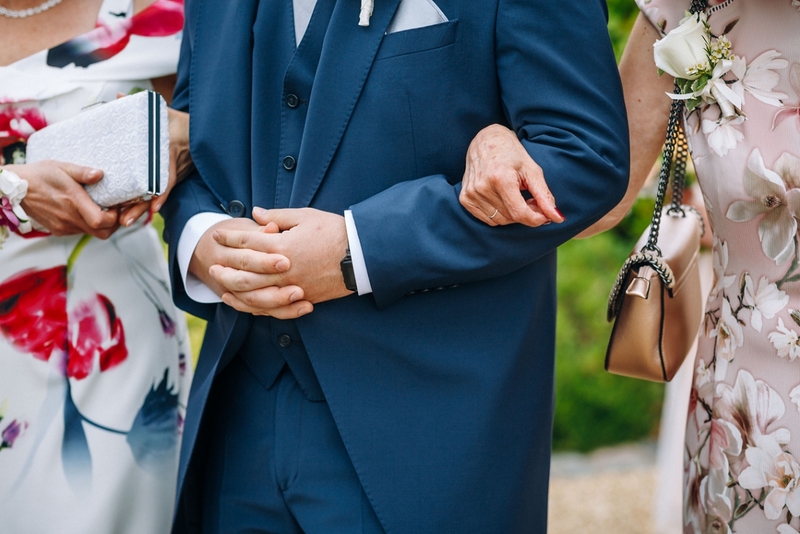 Not only are they kind and thoughtful, they are most definitely easy going and up for a laugh – which definitely shows in their couple shots – plenty of shots of Jen being swung round…and attempting to get over a fence, which is never easy for any bride. 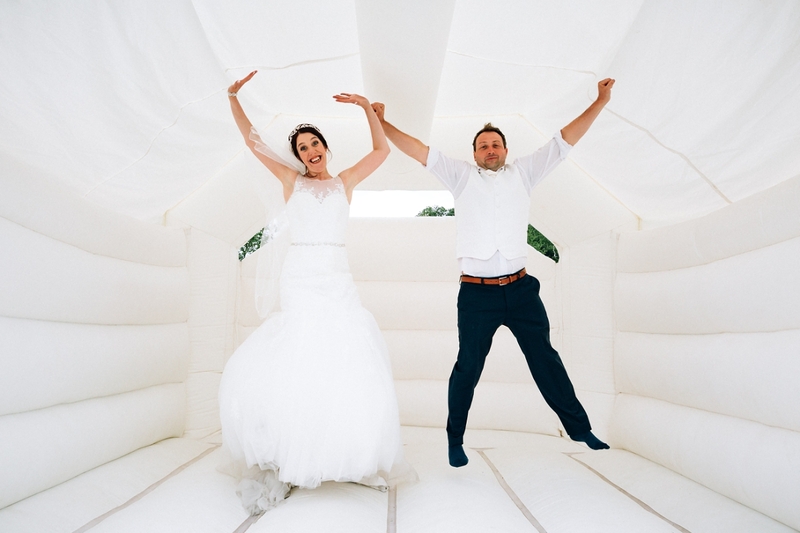 One of my favourite couple shots is of them on the bouncy castle too, such an awesome idea for guest entertainment AND for photos! 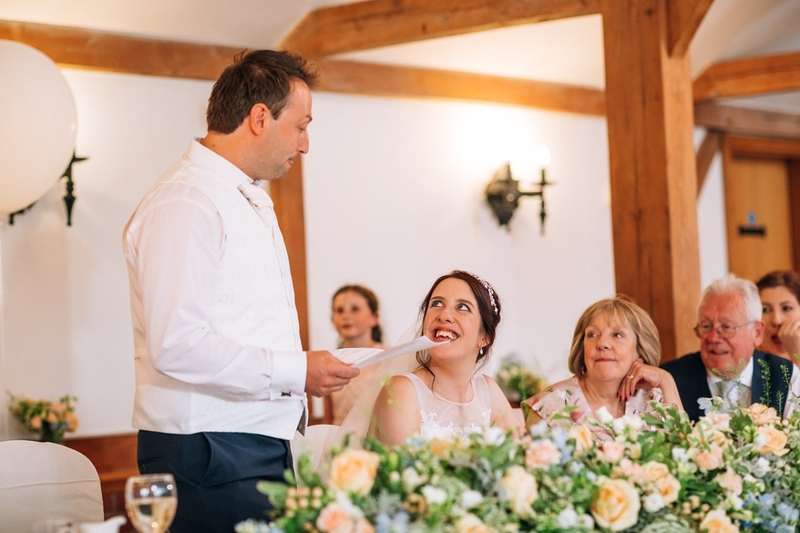 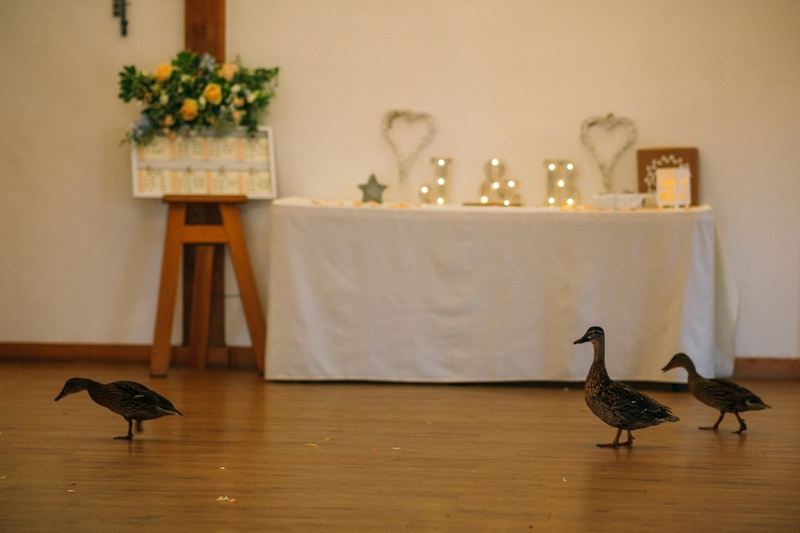 With the venue ready for their wedding breakfast, Jen’s dad made his lovely speech before the meal, and luckily avoided being upstaged by a family of ducks, who decided to have a waddle through to see what was going on just after – hilarious! 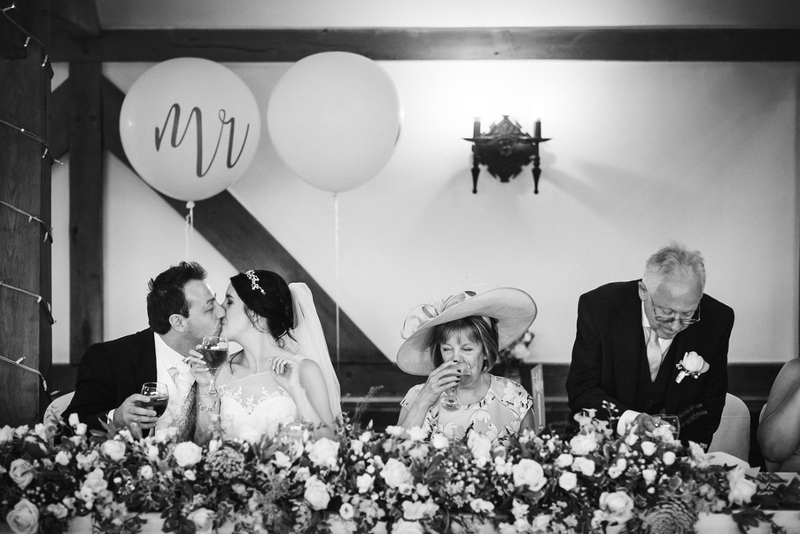 The food at Sandhole Oak Barn is always amazing and the newlyweds along with their guests enjoyed the meal with Baz and his best man doing their speeches afterwards. 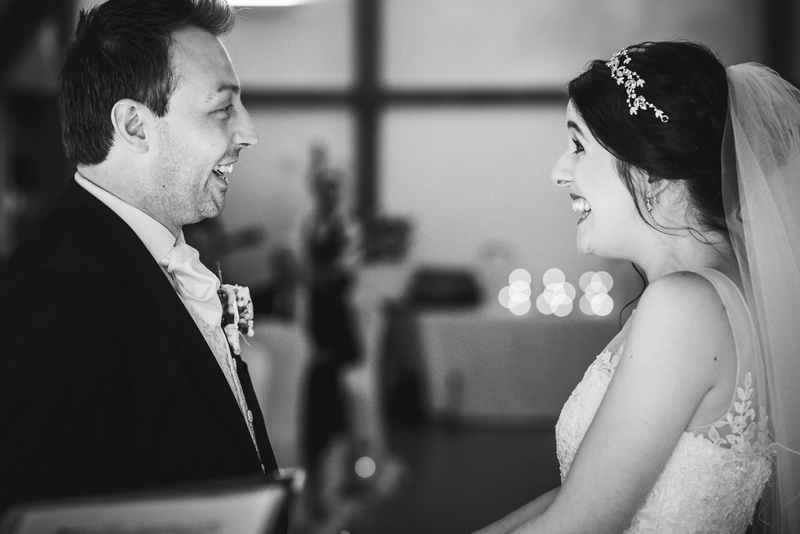 During the evening reception, the cake was cut, the first dance was had and Jen & Baz spent as much time making sure their guests were having the best time as they did enjoying it for themselves – a reflection of their thoughtfulness that they really made me feel like part of their day, rather than just capturing it for them. 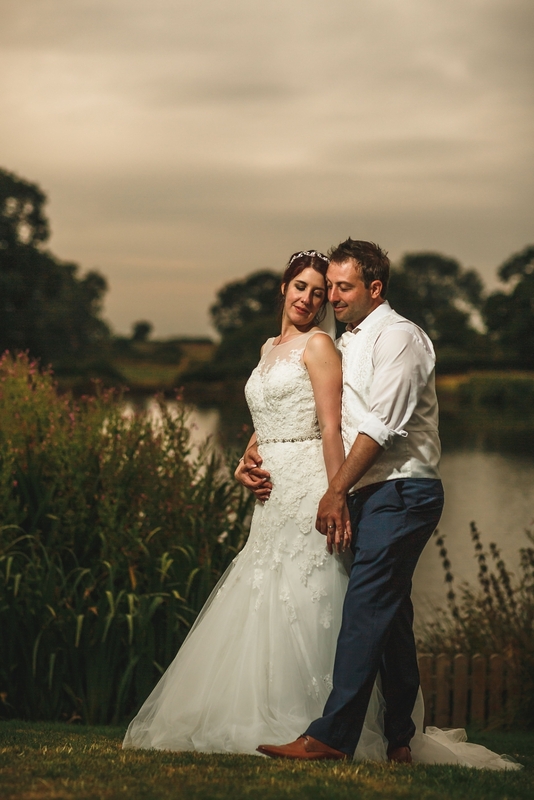 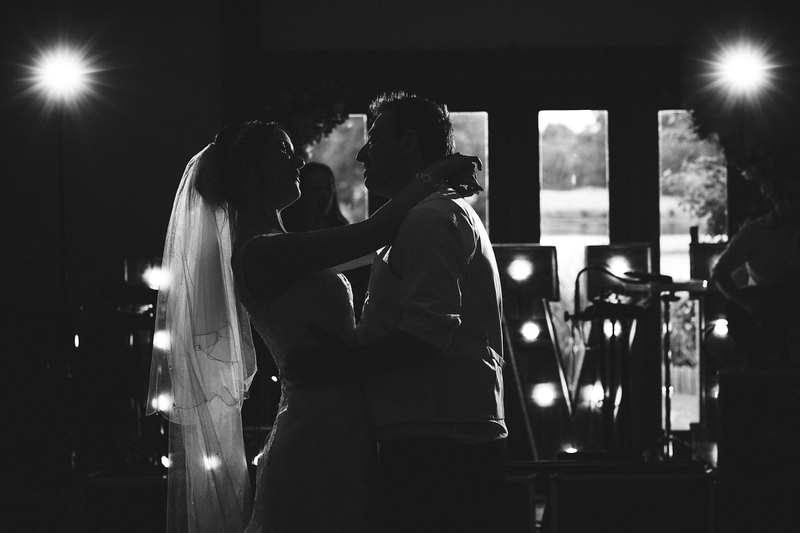 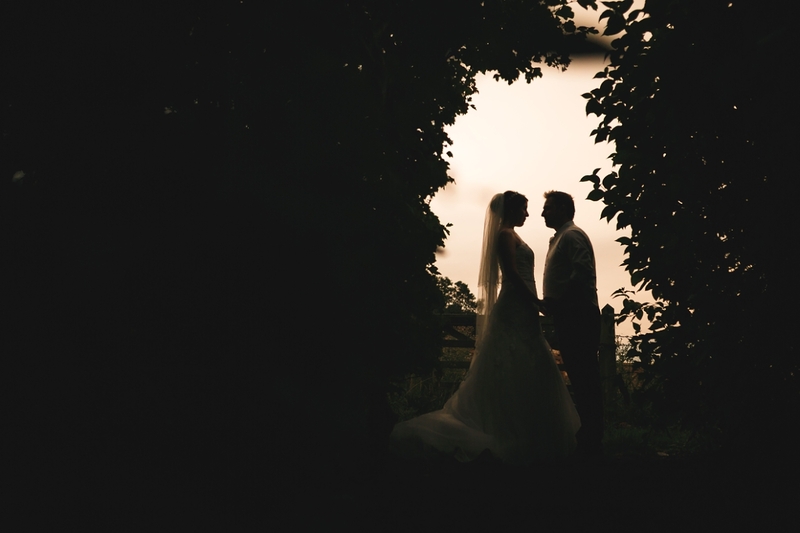 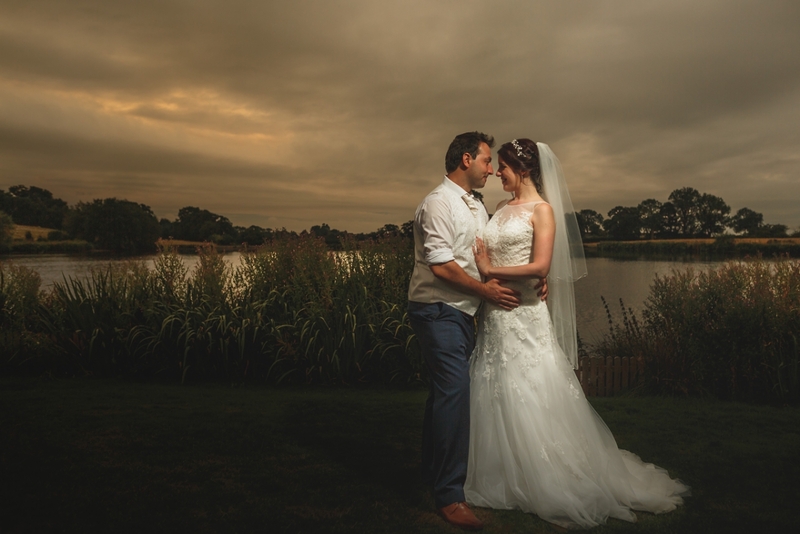 Jen & Baz, you two are absolutely made for each other and your wedding day was such a beautiful celebration of your love for each other and your family and friends. 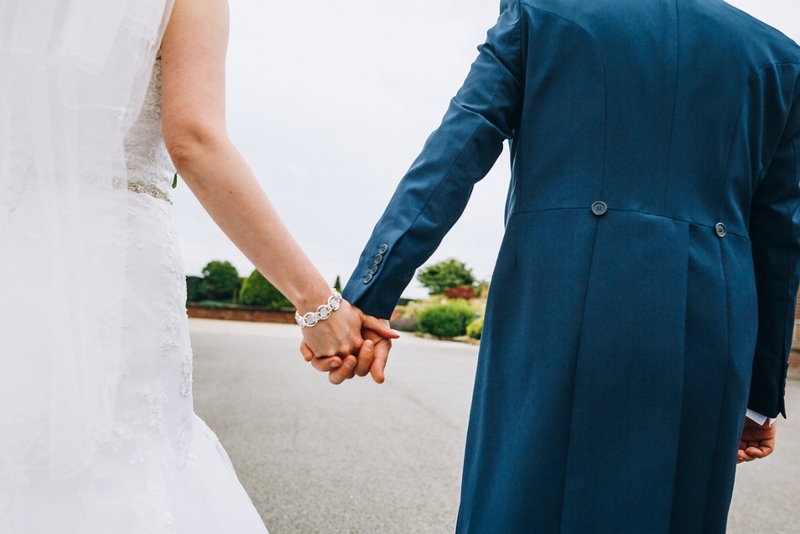 You absolutely rock and I thank you for choosing me to be part of your wedding. 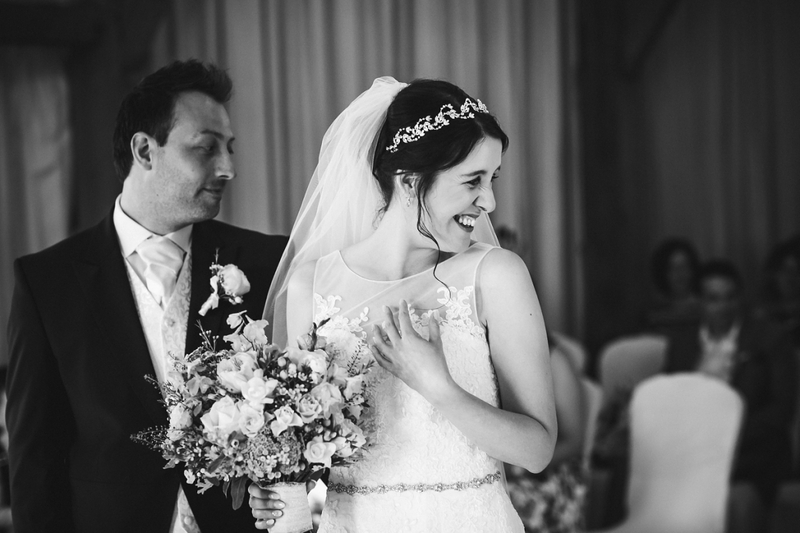 I wish you a lifetime of happiness together, you truly deserve it! 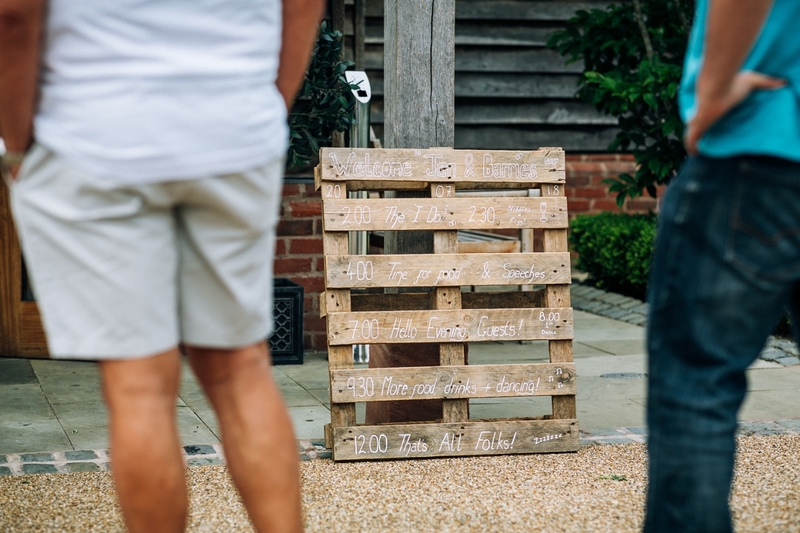 If you’re interested in booking me for your Sandhole Oak Barn Wedding Photography then please don’t hesitate to get in touch here.